The weekend had arrived, the Fylde team drove south on Friday and rolled into Wrest Park ready for the Longman Cup finals. The cup accompanied us, as Pendle (the current holders) had asked us to return it. We had opted to stay at the Cranfield University conference centre with the hopes of graduating to better success for the club. Like all good students, we retired to the pub to plan tactics for the next day and enjoy the excellent food and beer. We tried to ignore the ill-omens when the cream sank like a stone in the Irish Coffee. Saturday dawned, a heavy dew on the lawns but dry and bright. The setting was magnificent between the mansion house and the ornamental lake surrounded by a tree and statue lined avenue. The opponents were Woking and Fylde kept to the winning formula of the quarter finals, Leonard and Betty playing the doubles, Terry and Martin playing the singles. Martin was again looking to inspire us with his team talk (“Go and win”) and his now infamous knee-length white socks. The games started and Fylde made good progress in the singles, and after a balanced morning’s play, Martin and Terry secured wins. The doubles match was evenly balanced to the end but Woking secured their first win of the day to leave the score 2 – 1 to Fylde at lunch. A pleasant lunch was taken in the sunshine with the members of the Dyffryn team who were 3 – 0 down to Norwich in the other semi –final and were hoping for a serious upturn in their fortunes for the afternoon. The afternoon session started on a new set of lawns. Martin and Terry were warned by the locals of the infamous slope on the lawn. One look and they both thought “ If you think that is a slope, you need to play on northern lawns, where slopes are real slopes!” Both Martin and Terry quickly found their rhythm and dominated their games. Terry finished with a flourish, scoring a rover peel and using his last bisque to set up the peg out. Martin scored an equally convincing win over his opponent. 4 – 2 to Fylde and the match was won. On the other lawn, Betty was playing well and won her game to make the score 5 – 2, Leonard being unable to match his opponent at the end of his game. We retired to our rooms and found the perfect way to prepare for the following day’s final, a champagne dinner to help Liz and Peter celebrate Pendle’s victory in the Mary Rose competition (Well done to them). An early night and a hearty breakfast saw us back for the final. Dyffryn had reversed their fortunes and beaten Norwich 4- 3 and were our opponents in the final. Conditions were similar to Saturday but players on both sides struggled to get fluency in their play. Martin suddenly sparked and went on to win his game + 20, a true captain’s performance. Terry’s game was close but eventually was won by his opponent. In the doubles, Betty and Leonard were battling to get in to a winning position but eventually succumbed. Lunch and we were 2 – 1 down. 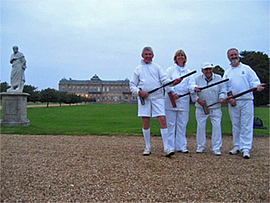 In the afternoon, Martin put on a superb demonstration of controlled croquet. He won his match very quickly, his opponent only have a handful of shots and an absolute minimum amount of time on the lawn. His opponent was a native of Wigan, prompting thoughts that Martin should be given a new nickname of “Martin Onfire”. Terry took inspiration, found his form again and dispatched his opponent well within time. The score was now 3 – 2 to Fylde and we needed Betty or Leonard to win. With 40 minutes to go they were both in the lead but only by a handful of hoops. Then, sudden drama in Leonard’s game. There was suspicion that his opponent had not recognised that he had made an error and continued, running further hoops. A spectator referee interfered, the tournament director was called, he consulted the chairman of the CA and there was commotion for 10 minutes before a ruling was given and play continued. Betty was still in play on the same lawn and managed to ignore the discussion and was able to hold on to her lead. 30 minutes left and the tension was mounting. We came, we saw, we conquered, ….. And we were proud.